A Berlin crowd listens as a German officer reads the Kaiser’s order for mobilisation on 1st August 1914. The following day, following the requirements of the Schlieffen Plan, Germany invaded Luxembourg and demanded free passage for its troops through Belgium in order to attack France. The German city of Cologne is seen in ruins on the 24th of April, 1945, as the Second World War drew to an end. Though is was hit by Allied bombs a number of times, Cologne Cathedral still stands. The city suffered heavy damage over the course of the war, and had come under Allied control in early March. In ruins after the attack. As the Second World War came closer to its end, German soldiers gathered to defend the Bavarian town of Rothenburg ob der Tauber on the 31st of March, 1945. The town, considered a model of idyllic Nazi life and used as an example for people across Germany, was bombed by sixteen Allied planes that day. Thirty-seven people were killed, and there was significant damage to structures, including the loss of hundreds of homes, half a dozen public buildings, and hundreds of metres of the historic wall. Even considering the extensive damage, the Allies were aware of Rothenburg’s historical significance and limited the attack in a way they did not with other targets. Today the town has been carefully reconstructed, and is a popular tourist destination that makes up part of the famed Romantic Road. 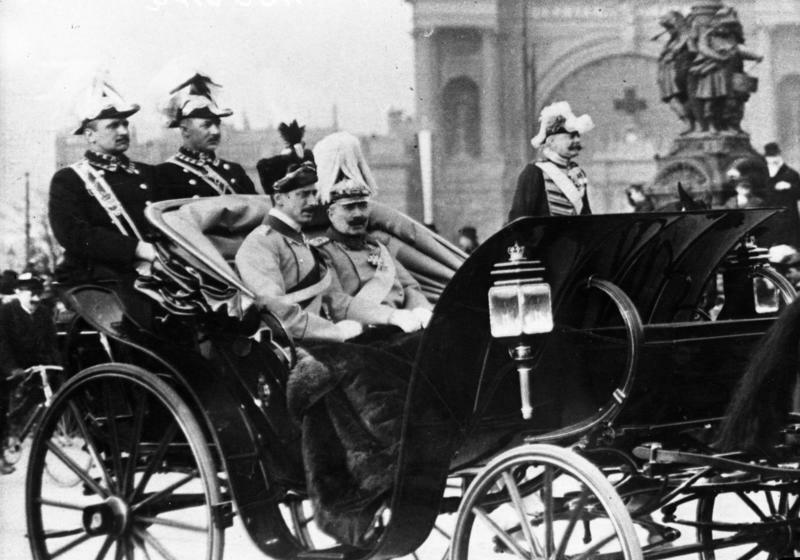 King Christian X of Denmark and the German Emperor Wilhelm II during a visit to Berlin in 1913. This image of the German city of Magdeburg was taken on the 29th of May, 1952, seven years after the end of the Second World War. Trapped behind the Iron Curtain, as the city was occupied by the Soviets at the end of the war (and the region turned into East Germany), very few of the city’s pre-war buildings were ever restored. Many were left in their bombed state or simply abandoned for years before being pulled down. The 24th of April, 1933 is considered to be the day Nazi Germany began their persecution of Jehovah’s Witnesses, as it is the date the Bible Student headquarters in Magdeburg were seized by police. This came only a few months after Adolf Hitler came to power. If Jehovah’s Witnesses were willing to renounce their religion they were promised freedom from persecution. Below is a Nazi renouncement document. From 1935 onwards, many people who kept their religion were sent to concentration camps. The persecution of Jehovah’s Witnesses continues today, with Russia outlawing the religion only days ago.